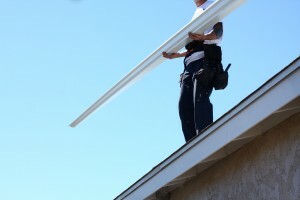 Gutter Goblins expertly installs Ultraguard gutter protection. Preventing your gutter from becoming clogged with twigs and debris is vital in preventing damage to your building. Maintaining and protecting the gutters on any building is important if you want to prevent damage that would be expensive to repair. UltraGuard is the most effective product on the market and our crews are specially trained in installing this. We install Ultraguard under the second row of tiles for increased security. Ultraguard Mesh is a premium quality anti-sheeting plastic or aluminium mesh with Colorbond® trims used to secure the mesh to the gutter. The mesh is precisely designed to provide clean filtered water, allowing maximum water in and maximum waste out. There is no surface water build up and this prevents the mesh holes clogging. 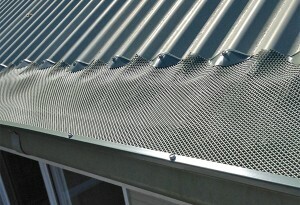 The mesh ensures gutters remain free of leaves and other debris. The ski-slope design uses gravity to allow leaves to fall to the surface below. The mesh covers a greater area of the roof. Protection starts from the roof end to gutter end. Contact us for a free assessment and answers to all your questions.